Back after a hectic trip to the most awaited wedding in the family. Thanks to the fellow blogger friends,who poured in hearty comments generously though I was not visiting your blogs for past 3 weeks . And coming to the recipe, this is another trademark recipe of my MIL. I learnt this recipe from her and this time I wanted to click pictures while she makes the curry and wanted to blog it,unfortunately could not.She told the recipe and method and asked me to blog later. She made this for me specially on the day we were leaving back to SG,how sweet  !! Cut brinjal lengthwise,onion lengthwise and chop the tomatoes.Peel garlic and if the flakes are big,cut them into two. Boil brinjal in water with garlic along with salt,turmeric and 1 tsp sambar powder(you can replace sambar powder with red chilli powder too) Brinjal gets cooked very soon so take care not to overcook them. After done, drain them reserving little water from it and keep a side. Heat a pan/kadai with oil and temper with the items given under the ‘To temper’ table. 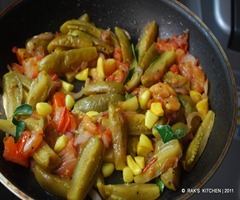 Fry onions till transparent and add the tomatoes, 1 tsp sambar powder with required salt. When tomatoes turn mushy,add the boiled brinjal, mix well and cook in medium flame adding little oil at a time, until the oil separates from the curry and the masala turns brown here and there. Do not turn frequently,just let it brown evenly. Try mixing this with ghee/sesame oil with hot steamed rice,tastes excellent!! You can add coconut oil if you like it’s flavour. Serve as accompaniment for rice. Such a simple curry.My mom makes the same with drumsticks.Tastes great with sambar rice.Nice step by step illustration. thats quite an interesting way of making the brinjals.adding garlic will surely enhance the flavour. Nice to see you back….Hope you had a great time in India..
Curry looks yummy Rak.Love it.Adding garlic gives nice taste. Simple n yummy curry..I cook brinjal together in d spices…but never added this much of garlic..will try next time..
Good twist to recipe by using garlic.. I am going to try this..Thanks. That looks great. I don't think i've ever cooked brinjals separately like that before for a curry. Perfect any rice .. But I cook a little diff way, I don boil the veggie seperately ..
the flavors of eggplant with garlic and tomato is awesome!…I make it sometimes!..like it! wow…sounds divine..must try this one..! I have never had curyy like this looks so so delicious. 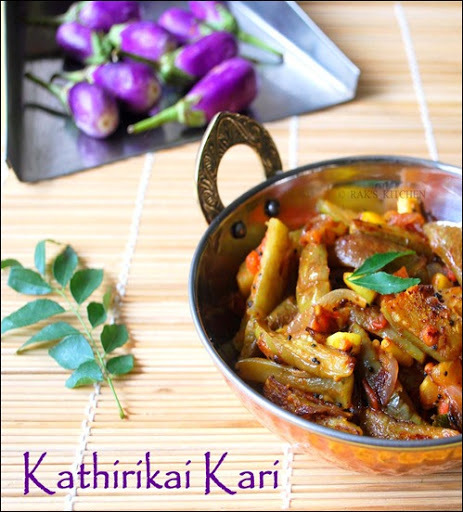 Amazingly simple to cook yet delicious looking brinjal curry dear. Loved the recipe and it's clicks. My fav with rasam rice.Irresistible brinjal fry. Simple but lovely curry…lovely flavour of garlic. I love this curry. It looks super delicious and truly mouthwatering. Brinjal and garlic goes well. Looks awesome. Curry is truly delicious.love it with rice too. Delicious curry, can have it just with curd rice..yumm! Simple yet tasty. Guess what? Just prepared baingan bartha yesterday for breakfast and another brinjal recipe from your blog when I opened the dashboard. Great people think alike, right? he… heee…. Curry looks yummy dear… nan unga oats idly try panan romba nala vanthathu.. Yen blog la upload panuran time kedaikum pothu.. 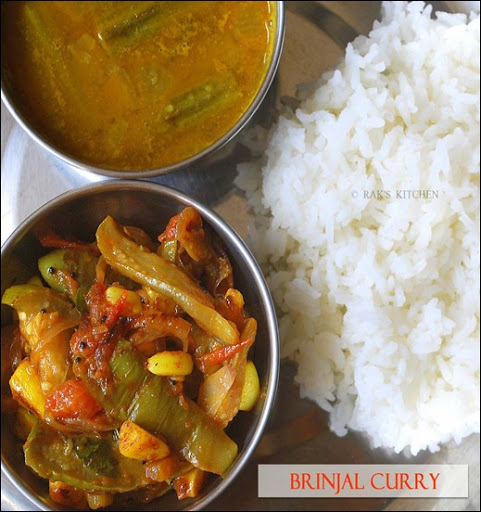 Interesting, never boiled brinjals before tempering it… Curry looks tasty though! Adding garlic is a nice new twist to this! yummy curry! YUMMY CURRY. I LOVE BRINJAL, WILL SURELY TRY THIS, WHEN DID U COME TO CHENNAI. I love to try this now. have brinjal @home.will do it. Another yummy side dish from ur maami 🙂 thnx for sharing.. This is one simple and scrumptious recipe, Raji! Honestly, I'm not a big fan of brinjal but that first picture makes me crave for your curry, ahh! Do visit my blog when time permits. Hi, I really liked look of the curry and tried out. It came out yummy and it was really Divine with Ghee & Curd rice. Boiling the brinjal with water is faster than cooking in the kadai but it wont work if you attempt to cook it with dry spice. Nice variation of boiling with water. hey raks .. I was a silent admirer and ardent lover of ur blog from past 2.5 yrs.. I am glad to know that u r also in singapore as I have recently moved here..
Also u click amazing pics ..